Despite the growth and usefulness of touchscreen interfaces, there’s still something to be said for a damn good keyboard. There is no doubt that, when typing over a prolonged time, a physical keyboard is vastly superior to tapping away on featureless glass. To that end dear old Microsoft has put together a wireless keyboard designed to be integrated into your screen-obsessed lives. 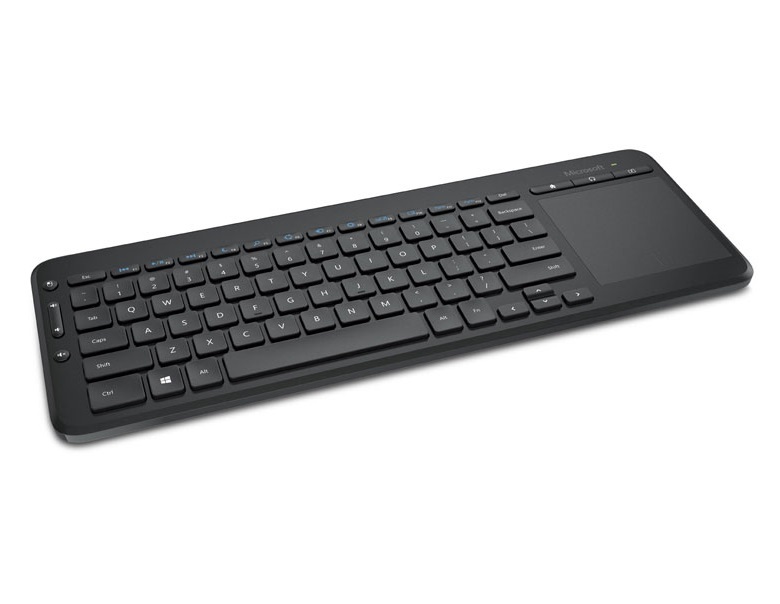 We test the Microsoft All-in-one Media Keyboard. First off, this is not a Bluetooth keyboard. Those are ten-a-penny these days, and are certainly (yet only really occasionally) handy to use with a phone or tablet while on the go. 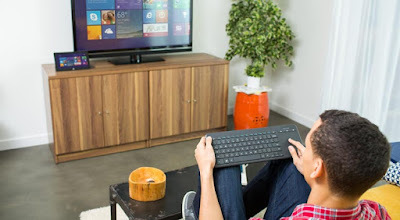 No, the Microsoft All-in-one Media Keyboard is aimed at people who need keyboard control for larger devices such as smart TVs and laptops. We love smart TVs here at The Test Pit, and normally they are a breeze to navigate, select the shows you want, and browse through your media. But as soon as you have to enter text into a search bar (we’re talking about you Netflix) it can take ages to select letters individually with the remote, W H I C H I S R E A L L Y A N N O Y I N G, isn’t it? Being able to use a real keyboard would make the whole process much easier, not to mention speed up browsing the internet on your TV. 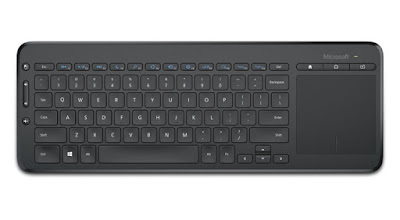 The Microsoft All-in-one Media Keyboard solves this issue by way of a tiny USB dongle which can plug directly into the TV (or a USB port on a laptop) to give you full text control. But that is not all. Notice the keypad on the Microsoft All-in-one Media Keyboard is missing? That is because it has been entirely replaced with an extremely useful trackpad – just like the one you’d find on your laptop. This eliminates the need for a separate mouse when using the keyboard, making the unit… erm… y’know… all-in-one. The trackpad features multi-touch control and also has some programmable media buttons above it. In use, the Microsoft All-in-one Media Keyboard is sturdy, solid, yet nice and light. You might not want to be lugging it around with you as it is a full-sized keyboard. But to provide a wireless keyboard for use with a propped-up laptop in the office, and to make your smart TV easier to use, it is perfect.